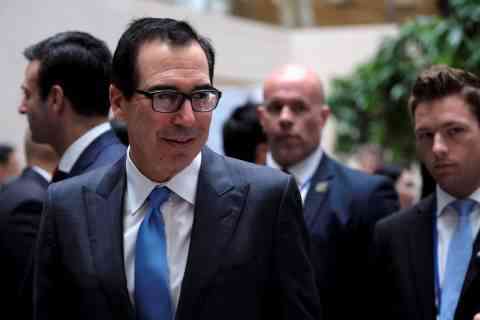 WASHINGTON (Reuters) - U.S. Treasury Secretary Steven Mnuchin on Monday said he would follow the law regarding Congress' request for U.S. President Donald Trump's tax returns but reiterated his concerns about lawmakers' demands. "We're analysing the law, we're consulting with the Department of Justice," Mnuchin said in an interview on Fox Business Network ahead of an April 23 deadline imposed by Democrats in the U.S. House of Representatives. "I will follow the law."